A supposedly fake human skeleton which has been on display at London Dungeon since 1975 has been found to be real. Guy's Hospital medical museum curator Bill Edwards thinks the bones, thought by staff to be fabricated, were wired together in the 1950s. Mr Edwards believes a second skeleton hanging in a cage at the south London tourist attraction may also be genuine. "I need to go back and examine that one more closely when the Dungeon team can get it down from the wall," he said. "But from what I could see, it looks either human, or a combination of some human and some artificial parts." The partial skeleton that has been proven to be real comprises mainly of a rib-cage and backbone. 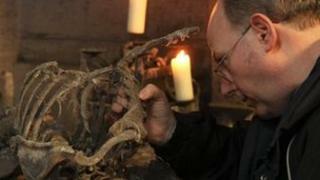 London Dungeon says the bones could date back centuries to the early days of anatomical research. London Dungeon operations manager Catherine Pritchard said: "We have no idea where they originally came from, but suspected they might date back to... when bodies were regularly smuggled in from the Far East for dissection." Both skeletons were due to move to the Dungeon's annual "Satan's Grotto" feature in mid-December, but will now have to be replaced by other props. Dungeon bosses now have to decide whether to pay more than £2,000 a year for a licence from by the Tissues Authority to keep the skeletons on display or have them removed altogether.